yesterdays post led to some discussion on art and ethics. Working with ethical questions (I am following Deleuze’s distinction between ethics and moral), is to my mind a – or maybe the – central challenge for contemporary art. Maybe the new isn’t just about making new inventions, but just as much about showing us the old stuff – the old horrible suffering – in new ways, so that some of us can stand up and take action? Here I will show you an outstanding work by the Irish born artist Richard Mosse, an image from his series The Enclave, a multichannel video installation, originally commissioned for the Irish Pavilion at the 55th Venice Biennale. Richard Mosse documents a haunting landscape touched by appalling human tragedy in eastern Democratic Republic of Congo, where 5.4 million people have died of war related causes since 1998. Shot on discontinued military surveillance film, the resulting imagery registers an invisible spectrum of infrared light, and renders the jungle warzone in disorienting psychedelic hues. At the project’s heart are the points of failure of documentary photography. It is an attempt to find an alternate strategy to adequately communicate this complex and horrific cycle of violence. Mosse’s work is on show both in Amsterdam and in London this spring. 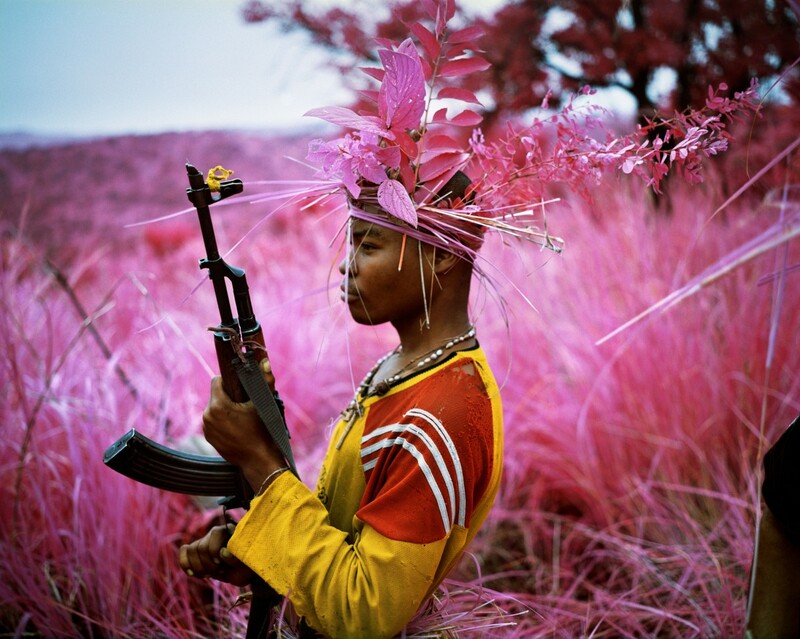 Richard Mosse was born in 1980 in Ireland and is based in New York. He earned a Postgraduate Diploma in Fine Art from Goldsmiths, London in 2005 and an MFA in Photography from Yale School of Art in 2008. WOW! Transmuting the violence of the gun, metaphor for this vile tragic war, and the banality of the nasty nylon tracksuit, into an extraordinarily beautiful image. Who said photography never lies? Ha! The ultimate advertising campaign.